I was taken into the inner sanctum of the real pros who made a killing in the market every single day. I learned the REAL way to make money in the market — secrets you won’t find in any book, video, news article, or financial journal. Just recently, I made $4,876 on Twitter… $7,189 on LinkedIn… $8,612 on CyberArk Software… $11,874 on Canopy Growth… and a whopping $29,301 on GoPro. I make these sorts of fast-paced trades all year long — collecting thousands every single day in the market. It doesn’t matter if the market is up… down… or sideways. For the first time ever, I’m sharing the secret with the world (LIVE on camera). Remember… you can win every single day in the market. It doesn’t matter what the economy does… or whether we are in a bull or bear market. You just need the right skills to analyze the market… and you can extract profits almost at will. Last summer on June 28th, I wrote to you and identified Air Canada (ACDVF) as a tremendously undervalued stock. Since then the rest of the market has caught onto the Air Canada story as the share price has subsequently risen more than 50 percent. But I don’t think that the Air Canada story is done. This stock is still BY FAR the best value in the airline sector, and today I want to crunch the numbers to show you why. But first, a quick reminder why we were looking at airlines in the first place. Over the past several years, Warren Buffett has invested billions of dollars into the four main U.S. airline operators. Combined, that is a $9.0 billion investment which even for Warren Buffett is enough money to show he is extremely bullish on the sector. So what changed to make Buffett warm up to airlines? The answer is competition. Or more accurately, the lack of competition. Buffett started investing in airlines in 2016 after U.S. Airways merged with American Airlines. The consummation of that merger marked the end of a decade-long period of constant airline consolidation which changed the competitive landscape of the industry. Instead of 20 plus airlines competing relentlessly for passengers, by 2016 the industry had been reduced to mainly the Big 4. Out went an era of discount pricing and relentless competition and in came an era of sensible pricing and widening profit margins. This industry is now what is called an oligopoly, folks. And while it isn’t great for customers, it is fantastic for airline profits. When I wrote last June about airlines, I noted that Buffett should have been looking north of the border at Air Canada if he really wanted to own an airline with some upside. Since then, I have not been proven wrong with Air Canada’s share price vastly outperforming all of Buffett’s four airline holdings. My opinion is that today it still isn’t too late for Buffett to get invested in Air Canada. The stock still has plenty of room to run. Buffett has invested in the four major U.S. airlines because the industry is now an oligopoly. In Canada there is even less competition with the market being essentially a duopoly consisting of just Air Canada (55 percent market share) and its main competitor WestJet (37 percent market share). Further, Air Canada shares are still very inexpensively valued. 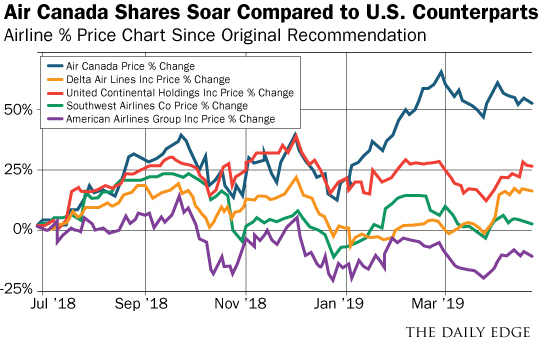 Today, the major U.S. airlines still trade at twice the valuation that Air Canada trades at relative to EBITDA (earnings before interest, taxes, depreciation and amortization). That means that relative to the U.S. carriers, Air Canada has both half the competition (only one main competitor) and half the valuation! When it comes to those two factors, smaller is definitely better. With the company now wrapping up a major period of capital investment in new planes, cash outflows are about to decrease significantly which means that the free cash flow the business generates is going to increase. Over the next three years, Air Canada’s management believes that the company will generate $4.0 to $4.5 billion in free cash flow. That is cash flow that is available after paying all of the bills and making all capital expenditures. If the company were to use all of that free cash flow to repurchase shares, it could retire half of the shares Air Canada has outstanding in just three years. That’s great news for the share price! Bottom line: Warren Buffett is bullish on airlines for good reason — the profitability of the industry has seriously improved. However, the best way to play the action is north of the border — where Air Canada operates with less competition, a cheaper valuation, and with a cash flow catalyst just over the horizon. China loves Starbucks (Exchange: New York; ticker: SBUX). After entering China in January 1999, there are now over 3,700 Starbucks outlets in China – making China the company’s second-largest market next to the U.S.
Starbucks sees so much potential for the Chinese coffee market that it’s aiming to have 6,000 stores in China by 2021. Homegrown competitor Luckin Coffee has about 2,000 outlets in China. And it’s catching up fast – opening 2,500 new outlets this year alone, which is nearly three times the rate of Starbucks’ ongoing expansion. This puts Luckin Coffee on track to have more outlets in China than Starbucks does by the end of the year. This fast-growing company now plans to raise up to US$800 million from investors by listing its shares on the New York Stock Exchange. So should you buy into its IPO? For a brief time only, you can watch a replay here. Inside, you’ll learn the name and ticker symbol of “The No. 1 Retirement Stock in America.” You’ll also hear an important announcement Porter Stansberry has waited 20 years to share. IPOs are exciting – they offer the promise of owning shares in a company with great plans for the future. And they allow ordinary investors to finally invest in companies that previously were unavailable to them. 1. Is the company profitable? Despite having 2,000 outlets last year and selling over 90 million items (mostly cups of coffee), Luckin Coffee isn’t profitable. Luckin Coffee disclosed that it lost US$241 million in 2018 on revenue of US$125 million. It lost nearly twice as much as it made in revenue. A fast-growing company that’s losing money isn’t unusual. There are many loss-making companies that have become successful investments, including Netflix (Exchange: New York; ticker: NFLX) and Tesla (Exchange: New York; ticker: TSLA). But it’s important for a loss-making company to have a strategy to eventually become profitable. 2. Does the company have an operating record? Luckin Coffee was founded in Beijing in October 2017. That means the company has only been in existence for a little over 18 months. By contract, Starbucks was operating for 21 years before it listed its shares. Having a track record is important, especially for a bricks-and-mortars business like selling cups of coffee over a counter. A long track record means a company has established that its business model works, and that it’s something it can replicate. So how was Luckin Coffee able to open up 2,000 outlets so quickly? Most of its outlets are what are called pick-up stations. These are kiosk-type shops that have little to no seating, are manned by just a couple of employees and are geared towards the takeout and delivery market. With most of the company’s outlets open for less than a full year, Luckin Coffee doesn’t have the operating track record that would show its business is sustainable beyond the current pace of growth. 3. Does the company have a unique advantage? Starbucks changed the way people experienced coffee in a retail setting. This has allowed Starbucks to expand into over 100 different countries and dominate almost wherever they went. Does Luckin Coffee have its own unique advantage? The answer right now is no. Luckin Coffee sells coffee at prices about 20 percent lower than Starbucks and focuses on takeout and delivery. Neither of these are unique. They are also easily replicated by companies looking to compete against Luckin Coffee in the future. These are just three important questions you need to ask before buying Luckin Coffee’s IPO (and any future IPO). And it pays to wait for companies to go through one or two earnings reports after its IPO. That way, you’ll have a better picture of what’s under the hood of the business. Comcast reported earnings for its first quarter of 2019 before the markets opened on Thursday. The stock dipped slightly on the news then was flat during premarket trading. Comcast said its revenue miss was due in part to the difficulty in comparing this quarter with the first quarter of 2018 based on the Winter Olympics and Super Bowl, which occurred in that period last year. Comcast had beaten estimates on the top and bottom lines for the last two straight quarters and seen its stock rise 25% over the past 12 months. As analysts continue to anticipate a decline in Comcast’s video segment, the company has laid out plans to branch out further into streaming. This quarter Comcast lost 121,000 video customers compared to 96,000 during the same period last year. Comcast-owned NBCUniversal, the parent company of CNBC, announced earlier this year that it will debut its free, ad-supported streaming service in the first quarter of 2020. The service will be available to any traditional pay-TV subscriber by logging in through a cable or satellite provider. Everyone else can sign up for about $12 per month, a person familiar with the company’s plans told CNBC shortly after the announcement. NBCUniversal’s service will be up against established streaming services like Netflix and Amazon’s Prime Video, as well as newer players coming later this year from Disney, Apple and AT&T’s WarnerMedia. Comcast reported revenue of $8.3 billion for NBCUniversal, a 12.5% decrease compared to the previous year, which had included $1.6 billion in incremental revenue based on the Olympics and Super Bowl. Comcast’s report included performance for British broadcaster Sky for the second time following its acquisition last year. Comcast reported pro forma Q1 revenue for Sky of $4.8 billion, driven mainly by higher content revenue. Sky added 112,000 customer relationships for the quarter, which Comcast said reflected growth in all of its markets. Cable communications accounted for $14.3 billion in total revenue. Cable networks, excluding the Olympics, accounted for $2.9 billion in total revenue. Broadcast television, excluding the Olympics and Super Bowl, accounted for $2.5 billion in total revenue. Filmed entertainment brought in $1.8 billion in total revenue. Theme Parks brought in $1.3 billion in revenue. Comcast said this quarter reflects its best quarterly EBITDA cable growth in over 10 years with a 9.8% increase to $5.7 billion. The increase reflects higher revenue despite a 0.8% increase in operating expenses. The Dow Jones Industrial Average was headed for a big drop on Thursday after a disappointing quarterly report from 3M. Dow futures traded down 121 points, indicating a drop of 171 points at the open. Shares of 3M dropped more than 9% after the company reported earnings that were much lower than analysts had expected. The company also slashed its full-year outlook and announced plans to cut 2,000 jobs worldwide. Futures on the S&P 500 pointed to a small gain for the broad index, however, while Nasdaq 100 futures indicated solid gains after strong Facebook results. Shares of the social media giant jumped 8.6% in the premarket. Wall Street ended Wednesday’s session lower on the back of mixed corporate results. Earnings will remain the biggest market focus Thursday with Comcast and UPS due to report before the bell. Amazon, Ford, Inter, Starbucks and T-Mobile are set to update investors after the bell. In terms of data, there will be jobless claims and durable goods at 8:30 a.m. ET and housing vacancies due at 10:00 a.m. ET. Meanwhile, Russian President Vladimir Putin received the leader of North Korea Thursday. One expert told CNBC the meeting aims to show Kim Jong Un that he has more options aside from the United States.